One benefit of TCO certification is differentiating yourself from the rest of the crowd when applying for a job or angling for a promotion. Your application might be one of dozens or hundreds. You need to make yours stand out from the rest so that it is short-listed. 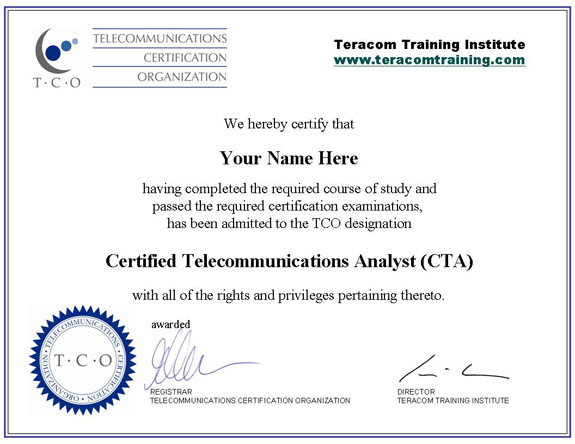 The knowledge skills confirmed by TCO certification are foundational knowledge in telecommunications, VoIP, IP, networking and wireless: the fundamental concepts, the mainstream technologies and how it all fits together. This type of knowledge and preparation makes you an ideal candidate to hire or promote to a task, as you will be able to build on your proven knowledge to quickly get up to speed and work on a particular project - then have the versatility to work on subsequent projects. ... a desirable thought to have in your potential manager's mind. Another benefit of TCO certification is evidence of Continuing Professional Education (CPE), and the achievement of Continuing Education Units (CEUs) to meet professional obligations. Of course, results are dependent on many other factors. Individual results may vary and are not guaranteed. CTNS ranked #1 best telecommunications certification worldwide! Copyright © Telecommunications Certification Organization. All rights reserved.